Apple Cider Bellini is the perfect fall cocktail recipe! It’s easy to make with only three ingredients, can be made as a single drink or as a pitcher, and is perfect for your Thanksgiving menu. Or, you know, a random day. Why is Halloween not observed on a Friday night? You know, so the kids and parents have two days to recover? I think that would make all parents, kids, and teachers happier, don’t you think? Jordan and I woke up totally Halloween hungover on Tuesday; tired, sugar crashed, and cranky. I made her get dressed and sent her off to school where she is pretty much going to be miserable all day…only to have to stay up late tonight for dance class. And we came home early – at 8:00! How do we go about starting a petition to observe Halloween on a weekend…or make November 1 a holiday? Ha! Anyway, other than waking up sick on sugar on November 1, I realized that it was NOVEMBER 1! FINALLY! It’s the real holiday season now, not some fake one. (Footnote: I hate Halloween.) It’s the month of Thanksgiving, and getting ready for Christmas, and leaves and champagne and Black Friday! Now this the start to my favorite season. Let’s celebrate with a fall inspired apple cider bellini cocktail, okay? Have you ever ordered a champagne bellini? I used to order a peach bellini at a bar in Las Vegas that was made with peach vodka, schnapps and champagne. In fact, according to Google, the definition of bellini is a cocktail made with peach juice and champagne. So, basically it’s a mimosa made with peach juice. I think most people now take it a step further and make the bellini (and mimosa, even) into any flavor juice with champagne. This apple cider bellini cocktail has only 3 ingredients and literally screams apple, in sight, smell, and taste. It sounds like it will be super sweet but it isn’t, depending on the kind of bubbles and vodka you use. Let’s talk about ingredients for a minute. Apple Cider. This is typically a fall ingredient; I bet you can find jugs of apple cider in your grocery store produce section with the apples right now. You can also use a good quality apple juice if you can’t find the cider. A bellini needs juice, and this is that component. Apple Vodka. I was at the grocery store recently when a bottle of Skyy Honeycrisp Apple Vodka jumped into my cart. Most brands make some sort of apple flavor, be it apple or caramel apple or sour apple. I can actually drink the Skyy version over ice with no mixer, it’s that good – and it’s not very sweet. The smell is amazing. Bubbles. There are so many different kinds of sparkling wine now. I used to say champagne was my favorite until I tried prosecco, and now that’s my go-to. It’s really about preference which one you use. I like my drinks less sweet, so I go with a Brut. If you want a sweeter cocktail, go with a dryer one. The dryer the sparkling wine is, the sweeter it gets. You can make an apple cider bellini cocktail for one (hello, Thursday) or you can make a pitcher (hello, Thanksgiving). Feel free to adjust the alcohol to juice content to your preference. 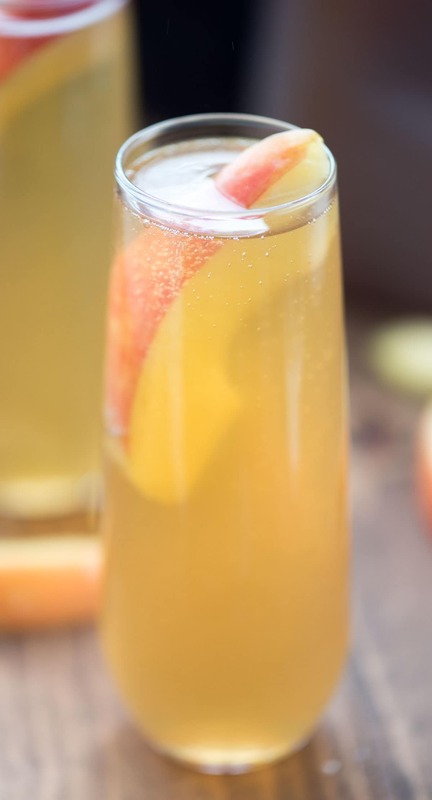 This Apple Cider Bellini is the perfect fall cocktail recipe! It's easy with only three ingredients and is perfect for your Thanksgiving menu. 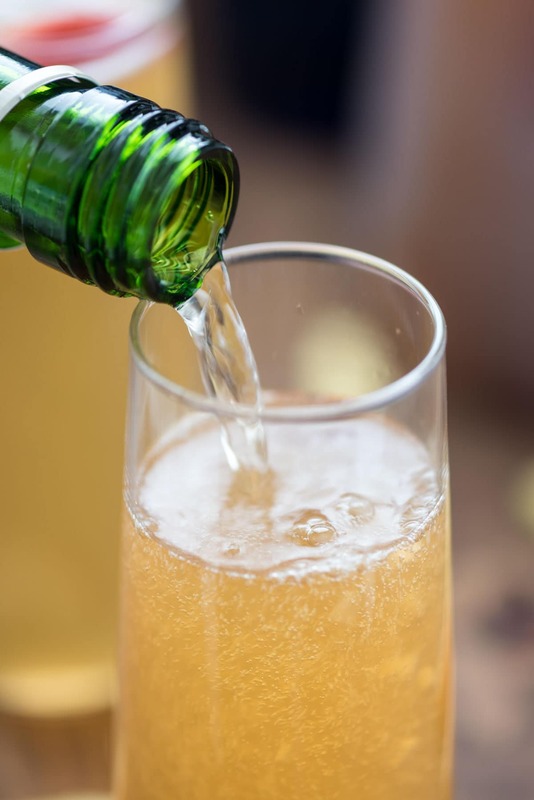 To make one cocktail: add cider and vodka to a champagne flute, then top off with champagne and an apple slice. To make a pitcher: add cider and vodka to a pitcher, then fill with a bottle of champagne and apple slices. My birthday weekend celebration starts tomorrow, and these look like a perfect way to kick off the festivities! 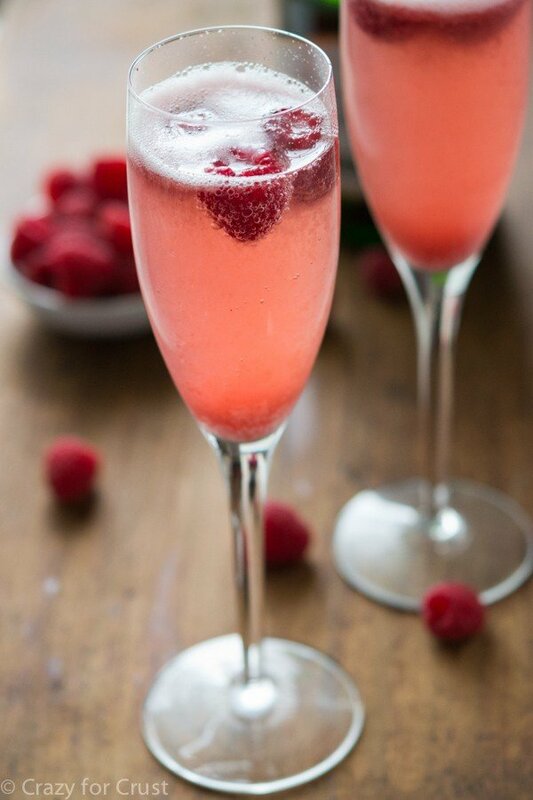 Love everything about these bellinis! Hi Dorothy! I love your blog by the way, it’s the one I keep up with the most often. I wanted to let you know that November 1st actually is a holiday- holy day is even where we get the word ‘holiday’. November 1st is All Saints Day, and the 2nd is the Commemoration of All Departed Souls. It is a holy day of the Catholic Church 🙂 people don’t get off of work or school for it usually but it’s an important day 🙂 I get what you mean though, I hope you both recovered on sleep! I’m with you on the Halloween thing for sure! (not my fav holiday, and it shouldn’t be on a school night!) I’m also with you on this scrumptious sounding cocktail! YUMMY! This bellini looks amazing! The apple cider makes it so festive, I love it!! 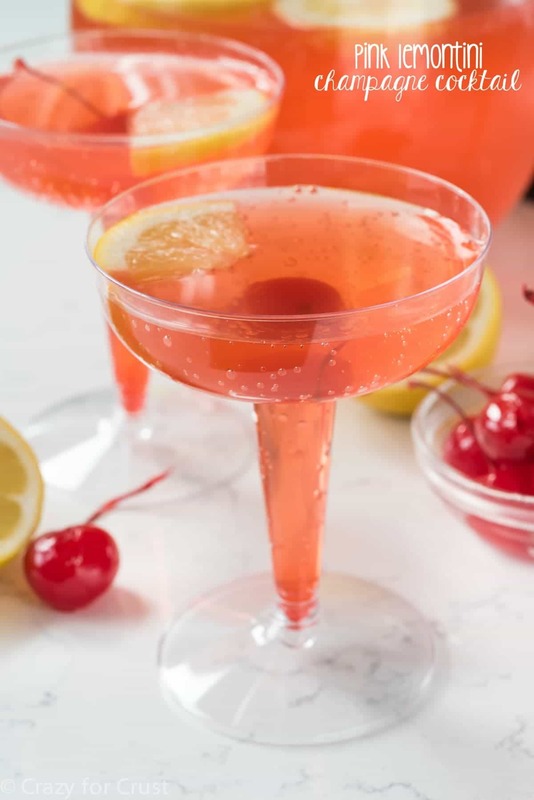 I need a signature cocktail for my dinner club this fall and this gorgeous bellini is perfect!!! I host a Thanksgiving Recipe Exchange with my neighborhood girlfriends every year- everyone is encouraged to bring a new dish they want to try out before the holiday to make sure it’s good enough to serve. I typically provide an adult bevy – have made cranberry sangria, apple pie sangria and a couple other things. This Apple Pie Bellini is definitely my favorite! SO simple to make (hello, 3 ingredients?!) 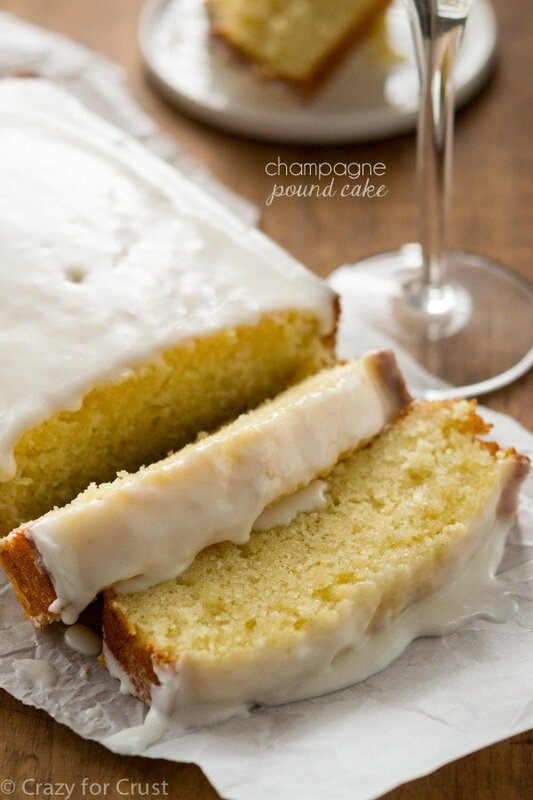 and a snap to ‘pour’ together – love that it was not too sweet like so many of the other beverages I’ve made. Served with an apple slice on each glass and it went over great, will definitely be my ‘fall beverage’ from now on!